The Congress on Sunday announced that its campaign slogan for the Lok Sabha polls will be ‘Ab Hoga Nyay’ while alleging that an atmosphere of ‘anyay’ (injustice) was prevailing in the country. The party’s campaign will be centred around ‘Nyay’ and the word not only alludes to the Congress’ proposed minimum guarantee scheme but encompasses justice to all sections of society, senior leader Anand Sharma said at a press conference. “There is a cry for justice in the country which has been denied to the poor,” he said while emphasising that “the campaign will focus on winning hearts”. Sharma said the party has followed the Election Commission guidelines and taken all necessary permissions for its publicity. The campaign’s main theme song ‘Main hi toh Hindustan hoon’ has been penned by Javed Akhtar. While the campaign film has been directed by Nikkhil Advani and the cinematography is by Tushar Kanti Ray, the concept and script was provided by Anuja Chauhan, and the music was composed by Arjunna Harjai, the Congress said. Congress president Rahul Gandhi, General Secretary Priyanka Gandhi Vadra, members of the campaign panel as well that of the core committee were involved in brainstorming the campaign strategy, Sharma said. Advertising agency Percept is behind the publicity campaign, he said, adding a young team also worked for the party as part of its digital media campaign. Its campaign on digital media platforms is being taken care by SilverPush, while other supporting agencies involved in the campaign include Design box and Nixon, he said. 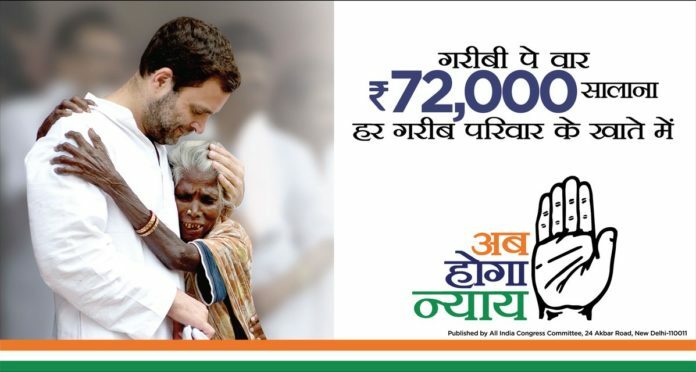 The themes covered in the campaign include the ‘Nyay’ scheme, poverty eradication, jobs for unemployed youths, farmers, women reservation, simplified GST, universal health care, education and startups as promised in the Congress manifesto. Party leaders said it is a 360-degrees cross-platform campaign that includes TV films, cinema spots, radio jingles, hoardings and digital screens, print advertisements, social media and public transport. A special feature of the campaign will be thousands of container trucks with Congress campaign advertisements on them taking the party’s message to various parts if the country starting Sunday. The campaign also has regional adaptations in six vernacular languages, including Marathi, Bengali, Gujarati, Assamese, and Malayalam. Members of the publicity committee interacted with civil society organisations, farmers, students, lawyers and a cross section of the society, said Singh, flanked by other members of the committee and senior leaders such as Motilal Vohra, Rajiv Shukla, Randeep Surjewala and Pawan Khera. The ‘Nyay campaign’ promises justice to youth, farmers, entrepreneurs and all those who have suffered injustice at the hands of the Modi government, Sharma said. The Congress has also come out with a number of campaign videos targeting the BJP government’s policies such as note ban, its “hollow promises”, and “rhetoric”. One of the videos also traces the Congress’ legacy and achievements of the past. “People are scared of talking over phone, there is an atmosphere of fear,” Sharma said, adding ‘nyay’ (justice) was the need of the hour. Surjewala alleged that the BJP has divisiveness and hate in its mindset, and claimed the Congress will do justice. Responding to a question, Sharma said in 2014, one of the factors was the BJP’s money power which played a major role in the saffron party’s victory. “Yes it is true we could not counter them. The BJP is the biggest advertiser of country. We cannot match them in money to power… We will beat them in truth and connecting with people,” he said, adding that jingles and radio will be used extensively for the party’s campaign. To a question on the issue of nationalism, he said it was not the sole right of Prime Minister Narendra Modi to talk about nationalism and the Congress has lost two prime ministers while protecting the nation. Slamming the Modi government’s Pakistan policy, he said the prime minister wants to eradicate terror but he went to Pakistan without invitation and the ISI was “invited to probe” the Pathankot terror attack. The armed forces belong to India and not to Narendra Modi, he said. The Congress’ chief spokesperson also dared the prime minister for an open debate with the grand old party’s leadership on the minimum income scheme.